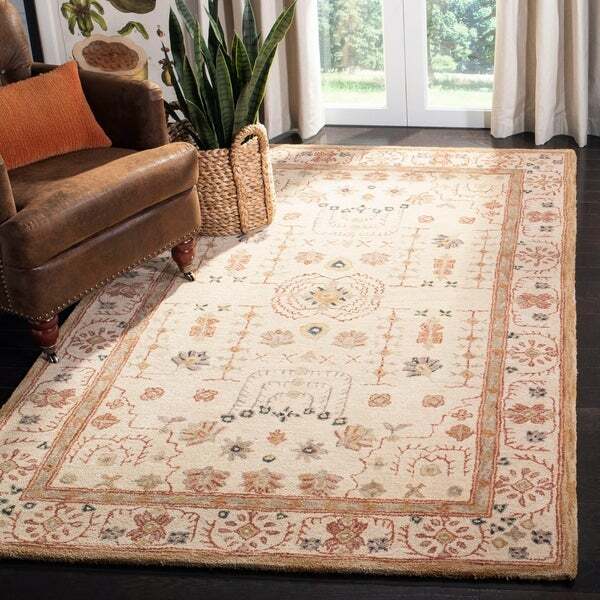 This traditional rug with hand-spun wool offers old world feel to a fresh new design. The hand-spun area rug with a sand background. beautiful but . . . This is a really beautiful Safavieh rug. I know what this brand costs as I have another one already, so I really practically stole this one! It is very thick and the appearance has a nice lightness and airiness to it because of the rather delicate design. It is one of those designs that will go with just about any fabric I choose to put on my parsons chairs when I reupholster. I have dark hardwood floors and this rug really stands out against them! My only complaint is that it is not as yellow as the picture. I was prepared for that as I have ordered other rugs from Overstock in the past and returned every one because the colors were so off from the picture. The field is really just a very light ivory; the only yellow is in some of the pattern and the outside border which is a golden color (very nice). The dark rust red in the design is very thin in outline so it could be considered many dark red colors depending on what colors you bring into the room (burnt orange, burgundy, etc.) so it is very versatile. I love the values on Overstock; I just wish they would upgrade their color representation and/or give a more detailed color description. Rugs are such a pain to return! I, of course, had a bit of trepidation about ordering a 9X12 rug sight unseen. I've done tons of shopping on Overstock and usually been extremely pleased. On the occasion I've had the send something back (usually shoes) it's an easy process. I knew this would not be so with a very heavy, very large rug. It took six of us to lay the pad and rug under my bed but it was immediately clear that the color was perfect and it's a high quality rug. It looks beautiful in my bedroom where I mix original deco furniture with funky lamps and mix match pillows and upholstered furniture. Just my style. This rug is a steal at the price I paid, delivery was very fast and efficient. I highly recommend. One note: with only myself to blame (I guess) I had typed in oriental as the category of rug I was searching for and most of the rugs were made in Pakistan, India and Iran. When we put the rug down on my floor and I looked at the tag that said "made in China" I was horrified. I referred back to the site and somewhere very small it does indeed state that. I WILL NOT BUY MERCHANDISE MADE IN CHINA until we work out a fair trade agreement. So, I was disappointed, in myself. I am usually a very careful shopper. I ordered this rug 2wks. ago. and I am very satisfied with this purchase. I had been looking for a rug for awhile and had not found anything I could afford and actually liked. The background color is sand (light beige/cream) and the design is similar to southwest Indian but it is subtle. The other colors in the rug are black, grey, very little gold in the pattern but it is edged with gold, and a dark (almost rust) orange. I used this rug in my LR & have a gold couch and chairs in a gold, light brown, bluish-grey and cream strip and I like how all the colors blend together. I used a rust colored lamp & vase in the adjacent dining room to bring the rooms together. I did hesitate to order a rug on line because of the cost of returning but after reading the reviews decided to give it a try . The price for 9x12 wool rug was GREAT!! and luckily I am not disappointed. The only draw back & the reason I did not give it an excellent review is the chemical smell. It is getting better but still present. I am in Florida and have had the a/c on but soon will be able to open the windows and hope that will help dissipate the remaining odor. I did not use any spray for odor on the carpet yet but if the open air does not work I will. I have not had much of a problem with shedding after the first few runs with the vacuum. Once ordered, we received the rug and pad eithin a week! The rug is thick and cushiony underfoot. Although the description did not specify the color black in the rug, there are definite black accents in the pattern. Otherwise, the colors are soft and the blue/green border goes great in my bedroom. The sand color matches my light oak flooring and has just enough color to anchor the bed. The pad holds it in place and provides the correct amount of buffer between the rug and floor. It does not shed, did not have a strong dye odor, and shipping folds came right out.. All in all, the rug is a great bargain for the money. You would expect to pay much more in a rug store. Thanks, Overstock! I ordered this rug for our basement that we are finishing...nearly there so we just opened the rug and placed it last night after it had been sitting wrapped for about a month. I was anxious to see what it looked like and I am very happy with it! The background is an almost gold, almost tan color...somewhere in between those. The colors are pretty true to what you see. Nice pile and thickness and the design is beautiful. Not the first wool rug I have ordered from Overstock and definately won't be the last. I also saw this on another website for around $1600 so this is absolutely a great price. This rug solidifies the Napa wine cellar look and feel of the basement we were trying to achieve. It really brings everything together. This is now my favorite rug in our home! We are very happy with our purchase. The colors were true to the picture. The pile is thick and the design is nice. It is shedding, which I understand is common for wool rugs. Overall, very pleased. I don't think we could've gotten a new rug of this quality for less money. This is a beautiful rug. The orange is burnt orange and the darker color could go well with charcoal, navy, or black. The ivory colored background is also quite nice and there is a bit of gold in there -- all very subtle, not too bright, which I love. Safavieh is a very chic rug store I remember being on Madison Ave in NYC. I passed it often when I lived there and admired the rugs. This seems to be the same brand (same logo) and if so, it is a quality rug. You can also feel that the pile is quite plush for an oriental rug. And the price is terrific as well. My only complaint is that at least for the first month or so that we've had it, it sheds like crazy. If my son sits on the rug to play, he looks like he's been attacked by 20 cats when he gets up. I've been vacuuming every other day to try and get rid of the shedding and it is helping but still there so far (we've only had it a month). Am hoping that settles down. But even with that, given the quality price and colors, I am happy with the purchase. The rug is just beautiful! More beautiful than the picture can show. There is little or NO sage in it. The border that looks sage on the moniter is really a silvery blue. If you need sage or green this rug is not for you. That being said I could care less about sage because I am so pleased with this rug. I wanted a rug with ivory and gold some dark accents and good quality. I got all that and more. The black in the rug adds some drama! I bought it for my dining room and now I cant stand the thought of covering it! Also you will never beat the price. $ 920 to 1200 on other sites. I had first seen this rug on someone's blog and she was sharing photos of her living room. She said she found it on Overstock. The rug arrived a day early, well packaged and there was very little new rug smell (as others had noted). I did search this rug and found it had been discontinued and had been selling for $1,200...another site had it on sale for $800+ and Overstock was $505 or something like that. The black in the rug is a little strong, but it is probably only something I noticed because I was feeling weird about purchasing a rug sight unseen. Very difficult to find a well made rug of this size for that price. I'm happy. The rug is nice quality but the real color of the rug is way different than the color advertised. I am disappointed. The color online is more yellow and red than what was delivered. The rug is a sand color as listed in their heading. It is not even close to the picture. The carpet is of good quality, Safavieh. It's comfortable and on the thick side. The color however, in my opinion, was not as pictured. I found it to be more beigy and rust with touches of black - not the golden tone you see here. I kept the carpet because I did not want to go through the trouble of sending it back. I now use it in another room that has Hush Paint by Benjamin more and an attempted Ralph Lauren look - and it works perfectly in that room. It's a very nice carpet, good quality, and if the beige/rust/blackish-blue color scheme works for you, it's perfect. It has a Navaho/American Indian feel to it - which also works in the room I ultimately ended up putting it in. This rug was a FIND. It works so well with so many colors. I have actually purchased it for multiple clients because the quality and style are such a great combination and you just can't beat the price for a wool rug. The carpet looks a lot like the online image. This is not a soft or plush carpet. I’ve had it for about 5 months and it sheds-a lot! My vacuum cleaners fills up almost immediately with loose carpet particles. Although I really like the look, I’m not sure I’d purchase again knowing how it sheds. Pretty rug, but price must reflect attempt to unload faulty rug. Hand knots pull out way too easily so I fear this rug won’t last long as it’s in a high use area. Pattern is distinct - more than the picture suggests as the background is lighter beige in tone, as other reviewers have noticed. Perfect for a guest room or living room that’s not used, I suppose. But I’d caution to think twice. This rug is beautiful. Everyone loves it. It took several months for the smell to go away and the fuss to stop coming but it's worth it. The design is somewhat primitive but that's what I love about it. Goes great with my leather furniture. "Is this rug available in a larger size? KDP 7.14.2013"
Hello karendenise, Yes here is one that is a little larger. #11234175 Thank you for shopping with us! "Is this rug available in 8x10 or 8 x 11?" Thank you for your question. This rug is currently unavailable in this particular size. I have attached a link of this rug in some other sizes for you. http://www.overstock.com/search?keywords=Handmade+Treasured+Sand+Wool+Rug&SearchType=Header Have a great day! "What is the return policy on rugs?" It is the same as our standard return policy which is : You can initiate a return for most new and unopened items within 30 days of delivery for a full refund. * You must return items in new or unused condition with all original materials included with the shipment. If the return is a result of our error or defective product, we will refund the full cost of the merchandise and shipping charges. "Hi, I know the wool was hand-spun, but after it was spun, was the rug hand-tufted, hand-knotted, or machined? Also, in which country was the rug made? Thank you"
This rug is hand-tufted. It was made in India.